Even with a shiny Media badge, not every chance we get to play a game on the PAX show floor is a 30-minute walkthrough by the developers - a lot of the time, it's simply a quick few moments to pick up the controller as you browse the show floor with everybody else. So, here are some of the titles I got to spend some hands-on time with, and some brief thoughts to go with them! Battleforge is a cross between a streamlined, less-complex RTS title and a collectible card game a la Magic. There's no base-building or resource-harvesting; instead you capture monuments and dedicate them to one of four colors (red, blue, purple and green). You can then instantly "play" cards that you've chosen before the game starts - for instance, a stronger squad of Red monsters will require you to control one Red monument and one monument of any other color. While many of the cards are controllable units, some are also structures (like towers) or actual spells that can be instantly played in real time. It's an interesting concept, even if the actual RTS gameplay isn't anything groundbreaking. While PvP will certainly be part of the game, I was told that there will also be an emphasis on group cooperative play with up to 12 players (with a comparison drawn to WoW raiding). That part wasn't playable at PAX, but it's certainly a ... unique idea as far as a RTS is concerned. 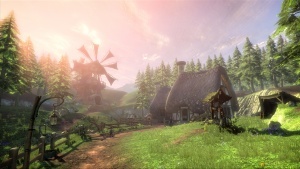 The build of Fable 2 on the floor was identical to the one from E3, so I won't tread ground Susan Arendt already covered, with a 10-minute combat demo completely lacking any of the things (like the customization or the character building) that makes Fable, Fable. The main draw of Fable was never the combat, but that was all they had on display. As far as the combat is concerned, I'm not really fond of the choice to have each of the three main buttons permanently dedicated to melee/ranged/spellcasting, which feels like a step back from the first game. As someone who prefers the "spellcaster" route, I dearly missed being able to map spells and abilities to the controller as I saw fit. If I wanted three different spells, I could do that; if I wanted a sword strike ability, I could do that too. While I think the current spell system - you can set spells in a tier that charges up the longer you hold the button, so you can either spam weak spells or wait longer for more devastating ones - is actually really cool, as is the manual aiming ... I can't help but feel like it'd be an even stronger system if combined with the flexibility of the first game's control.